Mumbai Indians skipper Rohit Sharma smacked 56 not out as the under-pressure defending champions registered a morale-boosting eight-wicket win over Chennai Super Kings (CSK) who saw their three-match winning streak end in the Indian Premier League (IPL) here on Saturday.In pursuit of Chennai's 169/5 -- powered by Suresh Raina's plundering 47-ball unbeaten 75 -- Rohit hit two sixes and six fours to ensure that Mumbai got over the line with eight wickets and two deliveries to spare to get their only second win in seven games.Mumbai captain Rohit, whose personal batting form was also questioned, got good support from openers Ervin Lewis (44) and Suryakumar Yadav (44) at the Maharashtra Cricket Association Stadium.Earlier, Raina blasted a 47-ball unbeaten 75, laced with six fours and four sixes, and more importantly was involved in a 71-run partnership with in-form Ambati Rayudu (46 runs off 35 balls), and another 46 runs with Mahendra Singh Dhoni (26 off 21) to propel the yellow brigade to a healthy total.Put in to bat, Chennai started the proceedings on a shaky note, losing opener Shane Watson (12) in the fifth over with the scorecard reading 26 runs.Watson's top edge was easily caught by Mayank Markande at square leg off the left-arm spinner Krunal Pandya delivery.Raina then walked into the middle and played the perfect second fiddle to in-form Rayudu, taking Chennai close to the 100-run mark.Just when the duo looked settled, Krunal struck again to break the partnership in the 12th over as a miscued shot from Rayudu landed safely in the hands of Ben Cutting's at deep midwicket.Rayudu 35-ball knock contained a couple of boundaries and four sixes.His dismissal saw Dhoni joining Raina and some fireworks by the Chennai skipper saw the addition of another 46 runs in the next 5.5 overs. 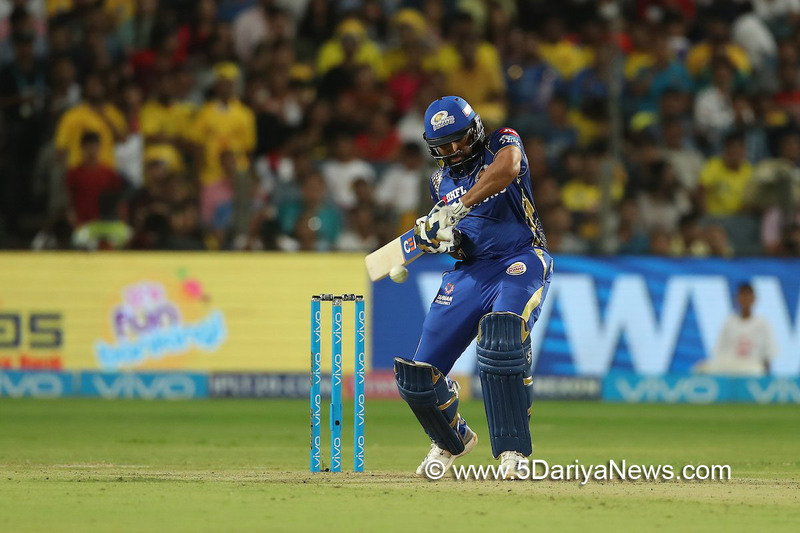 Meanwhile, Raina continued to keep the scorecard moving and brought up his fifty in the 17th over.Mumbai pacer Mitchell McClenaghan ended Dhoni's innings in the 18th over with Chennai's score reading 143/3. The Ranchi stumper consumed 21 balls and struck three boundaries and a six.Dhoni also reached another milestone in Saturday's clash as he became the first skipper to lead any side 150 times in the IPL.McClenaghan once again jolted the hosts by packing Dwayne Bravo for a duck. The hosts faultered a bit in the final moments of their innings as Sam Billings too, departed after scoring just three off five balls.Raina, however, ensured that he batted out the innings, and finished off in style by clobbering Hardik Pandya for a six over midwicket to take the home team to a healthy score.For Mumbai, McClenaghan and Krunal were the pick of the bowlers picking two wickets each, while Hardik bagged one.During the chase, openers Ervin Lewis (44) and Suryakumar (44) shared a 69-run stand before the latter was dismissed by veteran off-spinner Harbhajan Singh in the fifth delivery of the 10th over. Though it was a very good start for Mumbai, CSK bowlers did well to not allow the opening partnership to run away with the game.Then captain Rohit joined hands with West Indian left-hander Lewis as they stitched together a partnership of 59 runs to keep the visitors in the hunt. Medium pacer Dwayne Bravo bowled his international teammate Lewis in the first ball of the 17th over, to give some hopes to the home side, with Mumbai still needing 52 off 3.5 overs.Rohit and Hardik Pandya (13 not out) batted sensibly cut down the target to 22 off two overs. Rohit then hit medium pacer Shardul Thakur for four consecutive fours in the penultimate over to leave Mumbai five runs away from victory from the last over.Rohit and Hardik dealt with three singles and one double off leg-spinner Imran Tahir to coast to the big win.Despite the loss, Chennai remained at the top of the table with 10 points, while Mumbai jumped to the sixth spot with four points. Brief Scores: Chennai Super Kings 169/5 (Suresh Raina 75 not out; Ambati Rayudu 46; Mitchell McClenaghan 2/26) vs Mumbai Indians: 170/2 in 19.4 overs (Rohit Sharma 56 not out, Ervin Lewis 44, Suryakumar Yadav 44; Harbhajan Singh 1/20, Imran Tahir 1/21).